BillingServ - Making Invoicing Simple. Helping you to streamline your business. Our cloud-based platform is 100% secure with full DDoS protection, ensuring no unexpected disruptions to your business. 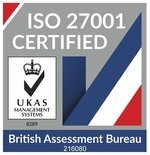 BaseServ has achieved it’s ISO 27001 that proves our commitment to the security of your data. We operate multiple servers around the world guaranteeing you a seamless service, no matter your location. Peace-of-mind is every business’ #1 priority. BillingServ offers three layers of network security, alongside enhanced firewall protection; plus, we are PCI compliant. Fixed transaction fee.Transparent and understandable pricing is one of our key principles. We know waiting for support can be a pain, so that’s why we offer fast response times 24/7, all you need to do is just holla! Why not join our happy customers already using BillingServ. What our customers say. Don’t take our word, take theirs. We have been using BillingServ for a short while, and so far it’s been delivering on every single point. Would absolutely recommend it to anyone! Their support team is second to none, they answer our support tickets within minutes. I have spent many hours looking for a suite that would tick all the boxes.. i have had trials with many other applications, none of which fully understood my business model or supported me enough. BillingServ in my opinion will become one of the best cross-industry billing and support platforms. The BillingServ team was very proficient with all my support requests. They offered additional services which were greatly appreciated, an excellent billing package for my consultancy business, as well as developing my website. I would highly recommend BillingServ. Switching to BillingServ is simple. No downloads, no integrations. Just import your data, and we’ll do the rest. Still not convinced? Review our platform for more reasons to switch to BillingServ. BillingServ is 100% focused on you. Our ‘anytime, anywhere’ promise extends to our support teams who will field your enquiries 24-hours-a-day, 365-days-a-year.